Are you looking for ways to lower your phone bill? 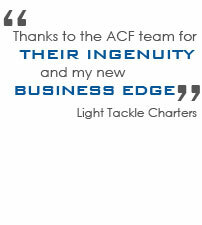 Look no further than ACF Consulting! For a limited time, we are offering a free phone and internet service analysis that can help you save money each month on your business phone and internet! Lower phone bills are just a phone call away. Contact us to get started! Having phone and internet service is a necessity for any business in today's world, but that doesn't mean you have to spend tons of money each month for it. In fact, a lot of business owners can make changes to their phone and internet plans that will save hundreds of dollars every year! A lower phone bill is easier than you think! Having a lower phone bill does not mean you have to sacrifice quality. ACF's voice and data analysis will compare your current service to other services that are equal or better than what you currently have. You can still have all the same features and benefits that you are used to, just at a lower cost! There's nothing to lose and a lot to gain! Contact us today for your free analysis and start saving! No risk, no obligation and nothing to buy! Our voice and data analysis is 100% free so you have nothing to lose! We'll provide you with the information you need to make an informed business choice. If you find out that we can lower your phone bills, you can switch systems and start saving money right away! If your current system isn't costing you any more money, you have peace of mind knowing that you are making the right choices for your business! Our voice and data analysis is a win-win situation!